Should You Replace Front And Rear Brake Pads At The Same Time? 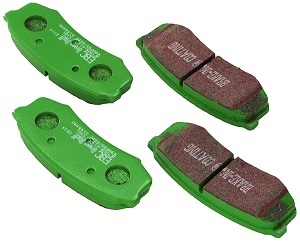 Click here to find a set of brake pads for your vehicle. One question we often get asked is whether you need to replace both your car’s front and rear brake pads at the same time. The short answer is that you can replace your brake pads in pairs (front or rear) as necessary, but don’t have to replace both sets at the same time unless they both need it. Your brake pads wear at significantly different rates when comparing the fronts to the rears. The reason for this is that your front brakes actually do most of the work. In fact, on an average car today, the front brakes are responsible for up to 70% of the total braking power. This is because of the way the car’s weight transfers during a stop. Upon applying the brakes, the weight transfers towards the front of the car. This increases the downward force on the front tires (called normal force in engineering terms) resulting in higher friction between the front tires and the road. Similarly, this removes some of the downward force from the rear tires and decreases the amount of friction between the rear tires and the road. A tire’s braking grip is directly proportional to the amount of downward force on the tire, meaning more downward force equates to higher braking grip. Car manufacturers compensate for the difference in braking grip between the front and rear tires by biasing the braking performance towards the front wheels. If the front and rear brakes applied the same amount of stopping power to the wheels, the rears would lock up much earlier than the fronts due to the reduced friction of the rear tires under braking which would result in some very squirrely cars under heavy braking. As such, the front brake rotors and brake pads on most cars are noticeably larger than the rears. Additionally, the hydraulic pressure you impart on the brake calipers each time you press the pedal is also often biased via the brake master cylinder, meaning that as you push your pedal, more brake fluid is diverted towards the front calipers resulting in more braking force. As far as when to replace your brake pads, you can tell when the time comes in one of two ways: your car’s brake service light will illuminate on the dash or the brake pads will be below the minimum allowable thickness established by the manufacturer based on visual inspection. Vehicles that are much older may not have a warning light, in which case there is sometimes a small metal component on a brake pad that will contact the brake rotor and squeal under braking once the brake pad wears below the minimum acceptable thickness. If you are going to replace your brake pads, it may also be a good time to consider replacing or turning your brake rotors as well. Overall, replacing the brake pads is relatively cheap and easy. You only need a few basic tools such as a floor jack and jack stands to lift and support the car, a lug wrench to remove the wheels, a basic socket set to remove your calipers, and a torque wrench to reassemble everything to the correct specification. You may also choose to use a caliper wind back tool to make life easier and may also want to use a brake bleed kit if you choose to bleed your brakes at the same time you swap your pads. Happy wrenching!